I remember when I first started buying weight gainers and protein supplements. One supplement store existed within a hundred miles of my house; Twin Lab dominated in name recognition; weight gainers came in your favorite flavors, as long as those were vanilla and chocolate. Contrast with today's brave new world of protein supplements: casein and whey, soy and glutamine peptides, hydrolysate and isolate. And now, there's a wide variety of flavors and pretty pastel colors to peer into while you drink. Here's a shakedown of the dominant protein sources out there. 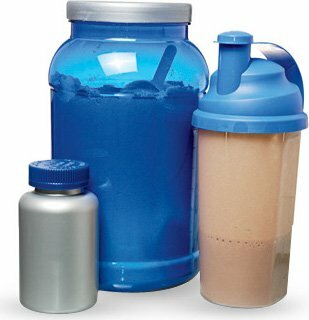 People seem to love premade protein shakes because of their convenience, taste, and these days, their availability at large grocers. They hold a special place in the hierarchy of protein supplements because governments require the pasteurization (with some exceptions) for dairy-derived drinks, including protein drinks. As whey peptides denature, or break down, at around 120˚ Fahrenheit and pasteurization temperatures run 160˚ to 190˚, more than 70% of the whey peptides get destroyed. However, the drinks still contain highly effective and anabolic proteins, which research has shown still contribute to 24-hour protein synthesis. Also, in a recent study in the Journal of Dairy Science, after cooling, it was found that several of the important peptides, such as alpha-lactalbumin renature (reform) during cooling. Despite decades of research on soy, the debate rages: Will soy shrivel your manly parts and enhance your breast size? Fortunately, the research doesn't support the idea that soy feminizes men. In general, soy protein absorbs at a medium speed between longer, slower proteins and the most rapidly absorbing di- and tri-peptides. This mid-level absorption rate makes soy anabolic for post-workout recovery, especially when combined with a hydrolysate-based protein (discussed below). Soy isolate, unlike its milk-derived counterparts, is heat stable, making it viable for use in premade drinks. Some interesting research in the Journal of Agricultural and Food Chemistry found that soy-whey isolate mixtures protect whey fractions from denaturing. So, if possible, find pre-made protein shakes with a soy-whey blend, for greater concentration of whey peptides. Whey is the pretty boy of the strength and muscle industry and comes in three basic forms: concentrate, isolate, and hydrolysate. Moving from the former to the latter, each increases in its ability to trigger muscle growth, especially post-workout. This seems due mainly to the increasing rate at which each elevates free amino acid levels in the bloodstream. Almost as important as whey's muscle-building properties is its powerful antioxidant capacity. Although much hype is given to antioxidants found in everything from seaweed to pomegranates, there's little evidence for the value of these substances on cell health and protection over long periods. That's probably because cells already have a protective antioxidant system that utilizes an amino acid called glutathione. You can supplement with glutathione alone, but taking whey maximizes cellular levels. Animal studies demonstrate everything from life-extension to cancer prevention because of whey's effect on glutathione levels. By decreasing oxidative damage, whey keeps muscle cells growing and firing at their peak. Casein also comes in a few varieties. There are intact caseins (caseinate or micellar casein) and there's casein hydrolysates. The two couldn't be more different. Intact caseins digest slowly, and the research doesn't show anything special about its ability to build muscle or decrease the breakdown of muscle during resistance training—called protein turnover or proteolysis. Although, post-training, research from Nutrition Research and the American Journal of Clinical Nutrition show that intact casein can increase strength gains and 24-hour muscle protein synthesis. Of the two, caseinate is the cheaper, inferior type but dissolves nicely in water, so it's great for shakes. The micellar clumps, forming what's not far from cottage cheese curds (consider using a blender). Because of their slow absorption, people consider these great nighttime proteins. Casein hydrolysate is the opposite of intact casein in every way: It absorbs quickly, spikes free amino acids, and triggers muscle protein synthesis. After the hydrolyzing process, casein becomes mostly di- and tripeptides (short protein chains composed of two or three amino acids) that can absorb in the gut faster than individual amino acids. Many people use wheat gluten hydrolysate and without ever hearing the phrase. That's because in the supplement industry, it's called glutamine peptides. Gluten hydrolysate appears to have no unique properties other than those possessed by all hydrolyzed proteins, or protein hydrolysates. Without exception, hydrolysates rule the anabolic landscape in the protein world. With their short-chain peptides, rapid absorption rates and ability to spike free amino acid levels, they're almost impossible to compare to other protein sources. Want maximum gains, then you need hydrolysates. Digestive enzymes turn isolates into hydrolysates, hence the reason we call hydrolysates predigested peptides. The hydrolyzation gives them most of their enhanced absorption characteristics. Besides absorbing faster than isolates, hydrolysates spike insulin levels by themselves, and when taken with simple carbs like in post-workout shakes, they increase insulin secretion. This is a huge advantage since the level of post-training insulin regulates factors that allow muscle to grow, but also stops the breakdown of muscle caused from the training session—the higher the insulin levels the better. Hydrolysates may increase insulin secretion, but if ingested before a meal, they can decrease the rise in blood sugar. Isolates do the same, but with lesser intensity. Who cares about blood sugar levels besides diabetics, you say? Anyone trying to get jacked without getting fat, that's who. When insulin levels are high, both muscle tissue and fat cells try to absorb sugar for storage—muscle stores it as glycogen, and fat cells as fat. Spiking insulin but lowering blood sugar levels therefore increases muscle growth without increasing fat cell growth and proliferation. This is an application of a concept called modulated tissue response: triggering growth in one type of tissue, while giving the opposite signal to other types. Hydrolysates may sound great, but caveat emptor: Research shows that the insulin and amino acid spike caused by hydrolysates is too short-lived to sustain muscle protein synthesis and may actually decrease it. Hydrolysates should be ingested in small quantities over long periods of time, or mixed with longer-acting proteins such as casein or whey concentrate. S.B. Wilkinson et al., Am J Clin Nutr., 85(4):1031-40, 2007. J.W. Hartman et al., Am J Clin Nutr., 86(2):373-81, 2007. M.T. Patel et al., J Dairy Sci., 73(6):1439-49, 1990. J.E. Tang et al., J Appl Physiol., 107(3):987-92, 2009. P.A. Sobral et al., J Agric Food Chem., 58(18):10092-10100, 2010.